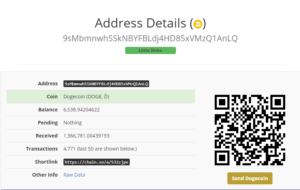 Very neat statistics – more than 1.35 Million DOGE has been claimed on this site! I have made about $4 in ad revenue and several enemies. It’s all worth it haha!! Thanks for participating, please be aware that I have raised the payout threshold to 10 DOGE because there is a 2 DOGE fee every time there is a cashout. Those fees are adding up and this will cut them in half for me. As always, feel free to donate.. Have not received any compensation for any of this. But I will continue to operate this site. BTC faucet will be replenished sometime this month I PROMISE.